Managing Cultural Change in Public Libraries argues that changes to library Strategies and Systems can lead to transformations in library Structures that can, in turn, shape and determine Organisational Culture. 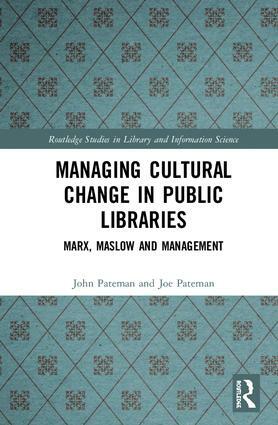 Drawing on Management theories, as well as the ideas of Marx and Maslow, the authors present an ambitious Analytical Framework that can be used to better understand, support and enable cultural change in public libraries. The volume argues for radical – but sustainable – transformations in public libraries that require significant changes to Strategies, Structures, Systems and, most importantly, Organisational Culture. These changes will enable Traditional Libraries to reach out beyond their current active patrons to engage with new customer groups and will also enable Traditional Libraries to evolve into Community-Led Libraries, and Community-Led Libraries to become Needs-Based Libraries. Public libraries must be meaningful and relevant to the communities they serve. For this to happen, the authors argue, all sections of the local community must be actively involved in the planning, design, delivery and evaluation of library services. This book demonstrates how to make these changes happen, acting as a blueprint and road map for organisational change and putting ideas into action through a series of case studies. Managing Cultural Change in Public Libraries will be of particular interest to academics and advanced students engaged in the study of library and information science. It should also be essential reading for practitioners and policymakers and all those who believe that communities should be involved and engaged in the planning, design, delivery, and evaluation of library services. John Pateman has worked in public libraries for 40 years in a number of different roles, ranging from library assistant to chief librarian. He was chief librarian of three library systems in the UK: Hackney, a diverse inner London borough; Merton, a multicultural London suburb; and Lincolnshire, a large rural county. John is currently Chief Librarian and Chief Executive Officer at Thunder Bay Public Library in Ontario, Canada. He is a fellow of the Chartered Institute of Library and Information Professionals, and he received the National Culture Award from the Cuban government for his work in support of Cuban libraries. Joe Pateman is a PhD candidate studying politics at the University of Nottingham, UK, with a specific interest in the disciplines of Marxist political theory and International Political Economy. Joe has written several essays from the Marxist perspective, on topics such as globalisation, inequality, poverty, international relations, political strategy, racism, hegemony and public libraries in the Soviet Union. His interest is in how libraries can provide democratic public space in an increasingly commercialised world. He is a member of the editorial board of Information for Social Change.